If you're into designer jeans check out Denim Blitz's periodic sales events. There's one in NYC starting today and running through Sunday, 10/15/06. Thurs. - Sat. 11:00A.M. - 8:00P.M. SEVEN FOR ALL MANKIND, TRUE RELIGION, CITIZENS OF HUMMANITY, 575, JOE'S, ANTIK, JAMES, YANUK, PAPER DENIM & CLOTH, HABITUAL, HUDSON, PEOPLE'S LIBERATION, TAVERNITI, DIESEL, EARNEST SEWN, CANALI, T-LUXURY, JOIE, TRUE MEANING, PUKA, TAHARI, 2 B REAL, ED HARDY, GRAIL, HOWE..., plus many more! YES, Ladies we have great fall dresses, leggins, fitted jackets, tee's, and hoodies +++ much more! **We have a top notch Costume Jewelry Designer selling her samples at prices you will die for. Her gorgeous pieces were sold in Bergdorf Goodman, Henri Bendel, Saks Fifth Avenue, Nordstrom +++ many more. YES, Guys we have a great selection of denim from Earnest Sewn, Paper Denim and Cloth, True Religion, Diesel, as well as many stylish tee's (Ed Hardy) +++ much more! Here's the industry side of the reporting. 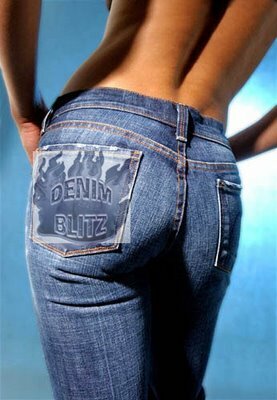 Denim Blitz is run by two (three? four? several hundred?? they declined to specify) energetic, lovely ladies and plan to roll out in Boston, Chicago, Philly, LA, and London in the future. They source overstock, season(s)-old, and miscellaneous lots of denim and bring retail it to the public in what appears to be great looking pop-up stores. This brand of pants is excellent, since I remember I used this type of pants. I always look for Viagra Blog and also for new styles about pants.